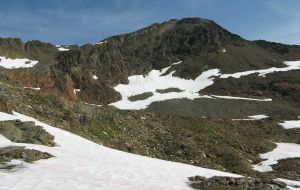 The highest peak in the Settlers Group, about midway along the NE to SW running alpine ridge that comprises the group. There is a remnant glacier on the north ridge. Name Notes: Named in 1969 by Curtis Arthur Wagner after Charles & Ruth Beguin. They settled in Argenta B.C. and their house was always open to visiting climbers.